"Please don't break the computer, Mrs. Turner," he says, trembling. "It has all Frank's backed-up game commentaries on it. They're so funny." He turns to Frank. "They're really funny." "Your mum's really like..." He blinks nervously. "She's like Goddess Warrior Enhanced Level Seven." "It's a compliment, snaps Frank, rolling his eyes. "Which you'd know if you played. Level Eight," he corrects Ollie." "Right," Ollie hastily agrees. "Eight." Our house is like a weather system. It ebbs and flows, flares up and subsides. It has times of radiant blue bliss, days of grey dismalness and thunderstorms that flare up out of nowhere. 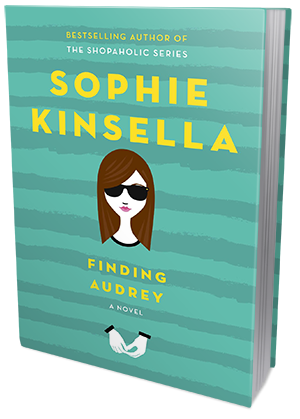 Sophie Kinsella's YA debut, Finding Audrey, is just as heartfelt and poignant as it is wonderfully charming and hilarious. It's a perfect book for a sunny afternoon on the beach. A great picker-upper, feel-good novel capable of making you laugh out loud and all teary-eyed at the same time. I loved it. I absolutely loved it. 14-year-old Audrey is suffering from anxiety disorder and depression. We don't know what exactly happened to her, but does it really matter? What matters is Audrey is sick. She doesn't go to school anymore. She doesn't take off her sunglasses and make eye-contact with anyone (not even her family, except for Felix). She can't even leave the house without a panic attack. Finding Audrey isn't a story about bullying, high school drama or revenge. This story is about healing, recovery and finding yourself. And it's brilliant. I loved so many things about this book, I don't even know where to begin. The characters were phenomenal! And not just Audrey and Linus who were at the center of this story, but all of the supporting cast, too. Audrey's 4 year old brother, Felix? I worshiped him from the get-go! This was a ridiculous case of insta-affection for me. That kid made my heart melt. I wanted to hug-squish him. According to Audrey "he greets most life events with disbelieving joy. A lorry in the street! Ketchup! An extra-long chip!" Seriously, how can you not love him? Audrey's whole family was amazingly fleshed out. Not a picture-perfect unit, but one so very real, I could relate to them on more than one level. The relationships in this book were all complex and realistically drawn, with plenty of foreshadowing. I enjoyed reading about Audrey's family and the struggles they were facing - from hilarious situations revolving around Felix to more serious issues revolving mostly around Audrey, but also Frank, Audrey's older brother. I thought the construction of the story was just perfect. Right at the beginning of the story Audrey tells us that something horrible happened to her, but she doesn't want to talk about it. She doesn't think it's necessary. The truth is, she probably can't talk about it yet and, honestly, she might never be able to. But as it turns out, the fact that we don't get all fixated on that big and terrible event in Audrey's recent past actually allows us to focus on Audrey's present state of mind. We see her the way she is - vulnerable, but trying to move on, terrified and paralyzed by fear, but willing to push herself (or allow others to push her). We don't see her as a victim of bullying or abuse, we see her as a fighter. I thought this was a brilliant move on Kinsella's part. It made this story way less dark and dramatic that it would've been otherwise - and thank god, too, because I really loved the humor! Audrey and Linus were fantastic together. Their relationship developed slowly and felt very genuine. I loved that Linus was more of a supporting character than this knight in a shiny armor who arrives on a white horse to save the damsel in distress. Yes, he helped Audrey a lot. He pushed her, challenged her, motivated her, and - ultimately - provided plenty of comfort and made her feel safe. Made her feel needed and wanted. That meant A LOT, but it wasn't everything. Audrey did a whole lot of healing on her own. Linus didn't find Audrey, Audrey found herself. And that's another thing I really loved about this book. 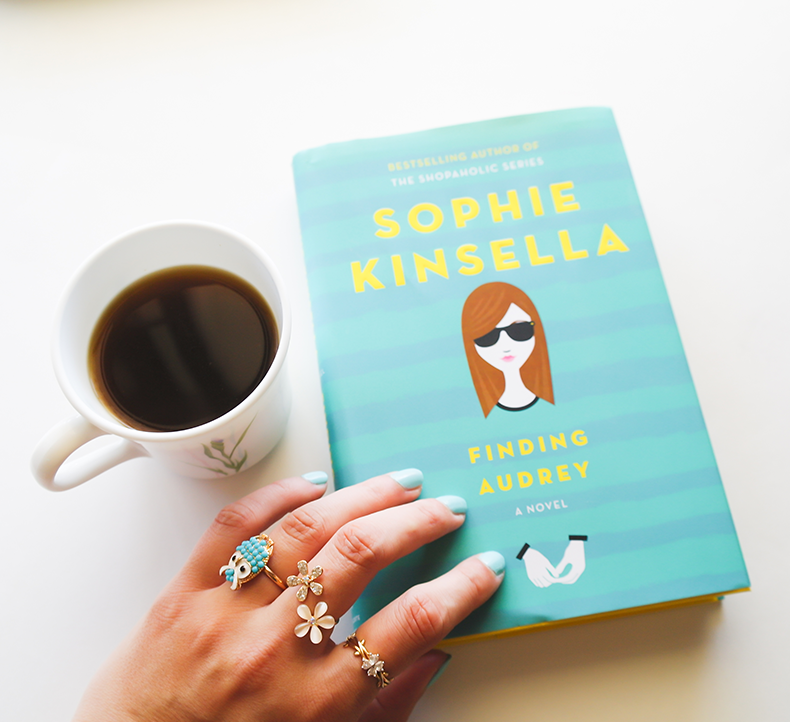 It can't be easy to find just the right balance between sad and happy, moving and funny, dark and hopeful, but Sophie Kinsella did it. She nailed it. Finding Audrey is a sweet book full of meaningful little moments, spot-on humor, charm and positive vibes. If I was suffering from anxiety or depression right now, this is the kind of book I would want to read. This is the kind of book that could possibly help me feel better and give me hope and motivation to push through. Having suffered from depression in my early 20s, I can tell you that Kinsella did a really great job describing Audrey's thoughts and feelings. Plus, she tackled this difficult and scary subject with incredible sensitivity and lightness. Usually books about mental illness, depression, anxiety and bullying are rather dark and disturbing. Finding Audrey is a bright ray of sunshine among those books.